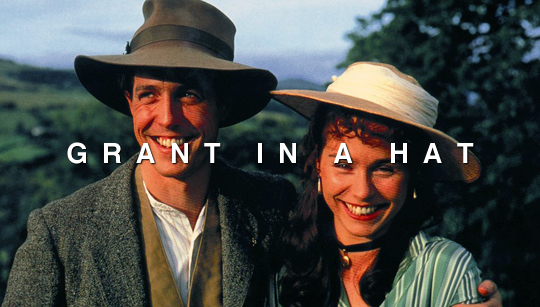 Ten films in and Grantwatch, my valiant odyssey through the annals of Hugh Grant’s back catalogue, is really starting to get interesting. I’ve already covered a lot of the basics — Four Weddings, About a Boy, both Bridget Jones movies — and now I’m getting on to some of the more obscure stuff. Yes, even more obscure than Extreme Measures. Last night I watched The Englishman Who Went Up a Hill But Came Down a Mountain, one of the oddest (and most elaborately named) entries in Grant’s thirty-strong cinematic oeuvre. 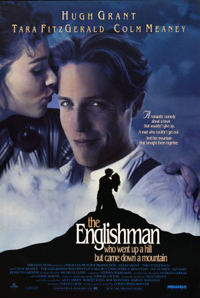 Released in August 1995 (just over a year after Four Weddings made him a household name) the film reeks unmistakably of contractual obligation, but that’s not to say that Hugh isn’t putting his all in. You’d be forgiven for assuming that the film’s lengthy title was a metaphor of some kind, perhaps referring to a triumph over adversity or a coming of age, but TEWWUAHBCDAM is a much more literal affair than that. Set in 1917, it tells the story of Reginald Anson, a young cartographer tasked with aiding the war effort by measuring the heights of Welsh mountains. Under new regulations, he’s forced to downgrade one such mountain to a hill due to its dwindling stature, much to the consternation of local villagers who set about ‘raising the mountain’ by dumping a load of soil on it. Well done everybody, take the rest of the week off. Still: a hot look for Grant, I think you’ll agree.